This is one of those meals that I can see myself returning to and tweaking in order to fit in with Weight Watchers propoints later in the year - it's not terribly bad for you really. It wasn't as much of a hit with D as I would have liked - he's going through a bit of a fussy stage in the run up to Eggy's arrival and has now decided he doesn't like broccoli any more. He did eat a reasonable amount of the pasta though and I enjoyed it. It's also part of my mission to try and up my broccoli intake a bit to help with my iron levels. Thankfully, latest tests show that they have risen, so something is working! I used this recipe as the basis for this one. Stats: - serves two adults and one child. Can easily be scaled up/down. 175g long pasta - I used Garofalo's cappellini - thinner than spaghetti, also known as 'angel hair'. First of all, preheat the oven to gas mark 8. Cut your broccoli into medium-sized florets. Toss this with about a tablespoon of olive oil and the Italian herbs to coat. Line a baking tray with greaseproof paper and lay the broccoli on it. Roast in the oven for about fifteen minutes - the florets should start to turn a little brown towards the end. Meanwhile bring a large pot of water to the boil and cook the pasta. Drain and reserve 150ml of the water, putting the pasta to one side. Using the same pan, fry your garlic gently in a little bit of olive oil for around three-four minutes, until the garlic begins to take on a little colour. Add your pasta, pasta water, parmesan, pepper and double cream and warm through gently. 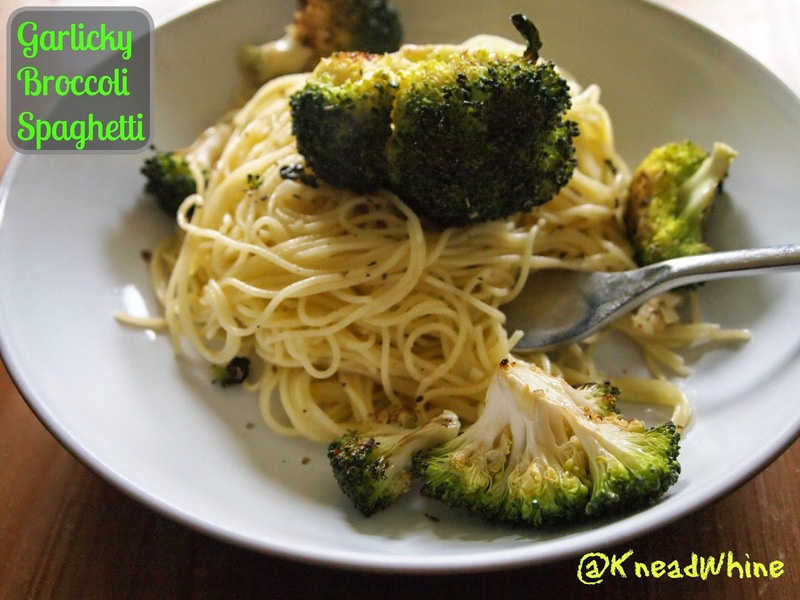 At this stage, your broccoli should be ready, add this to the pan, distributing the broccoli through the pasta.